Our technique is aimed at every good snowboarder who wants to enjoy the fantastic feelings given by extreme carving. It's therefore necessary to first masterize the basics that are exposed in this page. 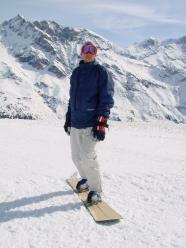 They derive from the teaching of the SSBS, the swiss snowboard teaching association of which Jacques Rilliet is member since 1988. This association proposes a book and a CD-ROM about snowboard technique and teaching that we absolutely recommend. We also advise to visit the site from our friends at CERN ski club that summarizes the "swiss" technique. 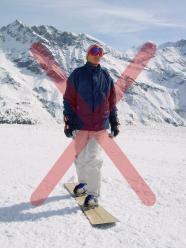 Based on the body rotation (in opposite to counter-rotation), this technique can be applied to each snowboard discipline (including freestyle and freeride) because it gives an extraordinary control and pleasure in any situation. It is directly inspired from surfing (sport in which feet are not bound to the board), which explains its effectiveness. The chest is vertical (don't lean forward), the knees are flexed, the arms stay along the body and must never be opened, except during the lain turn (see forward). Whatever the board or feet position is, the chest is facing the same direction as the feet (so it is more pointed at the nose in hardboot, than in freestyle). Be aware of your gravity center in the region of your hips, because all your movements should start from here. Be sliding in basic position and, before the turn zone, rotate your whole body toward the direction you want to go to, moving a little bit on your front foot (trick: look at the direction of the center of the circle that shapes the turn, the body will follow the movement). 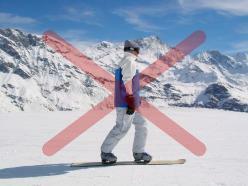 During this step, the snowboard won't turn and go on straight!... The turn begins at the moment where you block the body rotation because, with the inertia, the board will begin the same rotation and thus turn. At this moment, the turn itself begins. Don't do anything more instead than progressively center your weight and go on the edge. On frontside turn, your head must look over your front shoulder, because your chest must be parrallel to your board. You also should feel the plastic tongues of your shoes pushing with the same strength on each of your tibias. Think to keep your chest upright, your arms near the body and your knees flexed to absorb the shocks. On backside turn, keep your chest upright, avoid absolutely any sitting position with the chest forward. In this goal, you should do as if you would let yourself fall back in the direction of the center of the turn. Keep your knees flexed and don't put them together. You should feel both of your heels pushing on the edge with the same strength. Keep this position until the moment when you decide to change direction. At this moment, and not before, you may begin the next turn with the same process. Why is it good to keep the arms along the body? Because in case of misbalance, the arms will oscillate and increase the loss of control. Try to recover your balance by replacing your board correctly instead in gesticulating. Why is it important to keep the chest upright in all circumstances? Because if the chest is not over the center of gravity (the hips), The balance will be lost in case of shock caused by a bump on the piste. Why is it necessary to keep the knees flexed? in order to absorb all shocks caused by bumps, like with a car suspension. It's a turn driven on the edge, without any sideslip. The term "push-pull" has been invented by Jacques Rilliet in this Web site and is widely used over Internet now. It is the same principle as the rotation turn, except that in addition, you start with your knees flexed, then you do the rotation. At the moment you lock the rotation, straighten progressively your legs, until the middle of the turn. Finally, finish the turn by progressively flexing your legs, being ready to do the same process in the opposite turn. In the linked turns transitions, do the rotation during the last part of the flexion movement, so as to go directly from flexion to extention. Trick: don't think: "Im going down, then up" or "flexion... extension...". This push-pull turn technique needs a good physical condition (strong thighs and buttocks! ), but it is extraordinary efficient to control every most difficult slopes.